Nothing can replace the thrill or experience of witnessing a bright meteor, meteor outburst or fireball with your own two eyes while wrapped in a sleeping bag on a cold winter morning. These visual thrills are the benefits of meteor observing, and while that one fireball experience will make up for ten frostbitten toes, we cannot always afford the costs associated with visual observing which include time, missed sleep and sometimes physical suffering. Is it worth it to stay up all night in the freezing cold to see some flashes of light cross the sky? Of course it is. Is there an easier way to observe a meteor shower that requires less of an investment in time and energy? Yes there is. 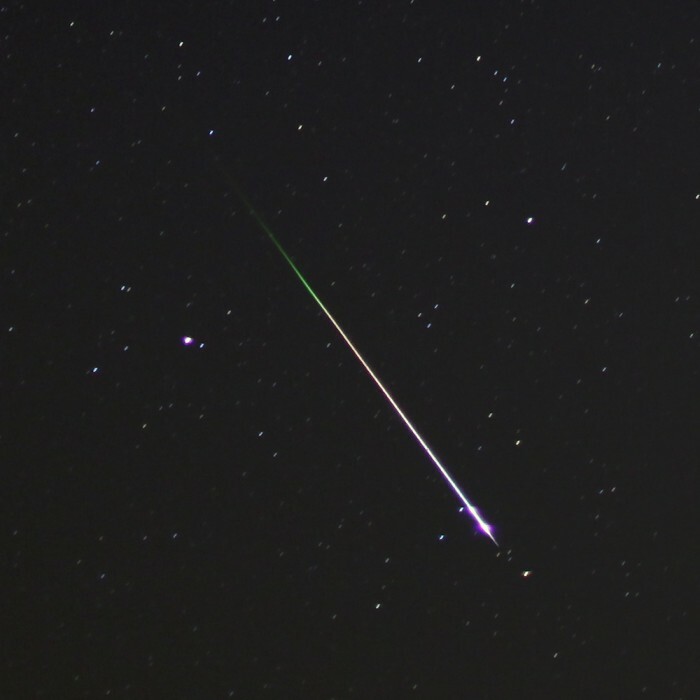 With the advent of digital photography, taking pictures of meteors has become much easier and cheaper, and as a result, a new observing method and art form is taking shape. Digital meteor photography can supplement or replace visual or video observing sessions. The benefit of camera observing is simple — when you finish your session, hopefully you will have one or more meteor pictures that you can study and share. The picture will not only be a piece of science, but a piece of art. 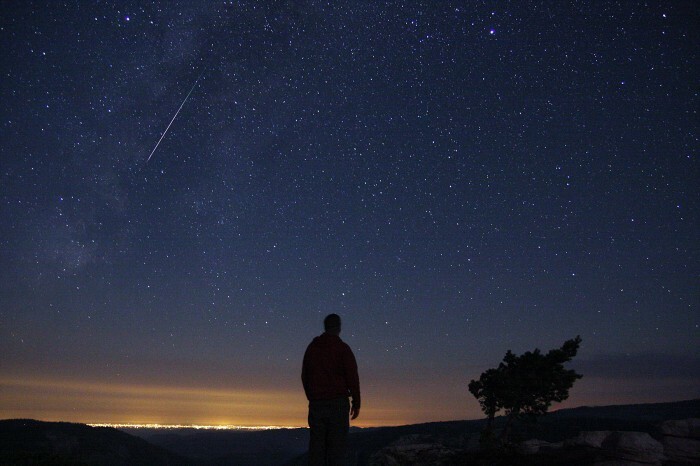 One can certainly debate the pros and cons regarding the different meteor observing methods — which is most effective, accurate, fun or scientifically valuable. I believe the best observing method is tethered to the goals of the observer. If you are only concerned with hourly rates, then radio observing is probably the best approach. For those who desire the experience, nothing can top visual observing. Meteor scientists tend to favor all sky camera video and believe the ideal exposure time for a meteor is a fraction of a second. While it’s true a DSLR can miss low magnitude meteors, and it will not be able to gauge the meteor velocity (without modification), the DSLR will record the meteor location relative to other stars with a degree of precision much higher than an all sky camera. People have been taking pictures of meteors for decades, but with the onset of digital cameras this task is now much easier and cheaper than ever before. As a spoiled astronomer raised in the electronic age, I can’t fathom how someone could have coped with film based astrophotography twenty or more years ago. The immediate feedback system of a digital camera and its ability to take hundreds or even thousands of pictures in a single night are critical to success with meteor photography. We never know the exact moment when a meteor will shoot across the sky, so, if we want to catch one on camera, we must photograph the sky all night long. The cost of capable DSLR cameras, lenses and accessories has come down in recent years, and you can acquire all of the basic equipment needed for meteor photography for around $1000. Of course those with a taste for the high end could spend twice that on just a lens, but for the sake of this article we will keep it simple. A review or recommendation of cameras is out of scope for this article, but for photographing meteor showers, the important things to have on your camera are: 1) a manual mode setting where the exposure time, ISO and f-ratio can be set and 2) a port to plug in an Intervalometer. If your camera has these two things and can be mounted on a tripod, then you can use it for meteor photography. The camera lens is the single most important investment you can make in your meteor photography rig. There are two things about the lens that are most important — the f/ratio and the field of view (FOV). We will start with the FOV because it’s simple: the wider the field of view, the more sky you can capture and the more meteors you will catch per hour. Unfortunately, as you go wider you lose resolution because more sky is being placed into the same number of pixels, in effect making each object smaller. While many of us desire to image the entire sky, often a better quality picture can be taken with a smaller field of view. The f/ratio or lens speed is usually written on the lens as a ratio (for example, f/2.8), and represents the focal length divided by the aperture. The f/ratio can be a difficult concept for new photographers, but what it means in meteor photography is this: with a faster lens you will capture fainter meteors. If the f/ratio is too high, you will miss most meteors. Ideally you want something in the < f/2.0 range. I have been successful with lenses up to f/2.8, but in my experience, once you go above f/3.0, your prospects of catching meteors rapidly diminish. There is nothing more frustrating than watching a meteor fly through your field of view only to check the camera and find out that the meteor was not imaged! An intervalometer, also called a cable release, is a device that allows you to program and control the camera shutter without touching the camera. These devices can be programmed to take pictures in intervals using the camera’s ‘bulb’ setting and are often used for time lapse photography. There is also a button that, when locked in place, is equivalent to continuous shooting. The cable release controls your camera so you do not have to. 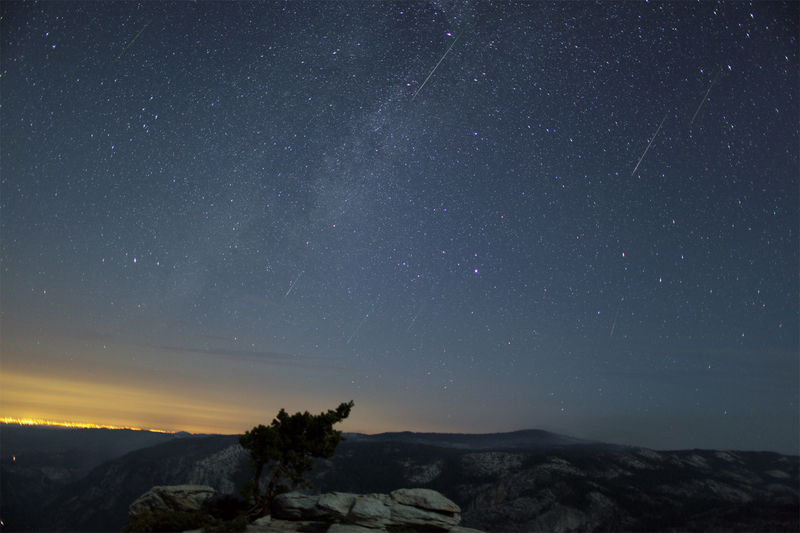 Power management and data storage are also considerations when photographing meteors. If you want to go all night long, a large capacity memory card and a few back up batteries are needed. A continuous or long term power supply is not required but nice to have, since most batteries will only give you about 2 hours of continuous shooting. There are two useful camera power adapters made for most cameras. Both mimic a battery and are inserted into the camera in the same way. A wire hangs out of the battery port and will plug into either an AC wall outlet or a DC car lighter style outlet, depending on which adapter you have. If you’re close to home, you can use the AC adapter and an extension cord to power your camera all night long. The DC adapter is commonly used with car-battery-type power supplies. Using this power adapter with a Celestron Power Tank, for example, will give your camera and dew heater enough juice for the entire night. I often use the AC adapter from my yard but rely on the DC adapter and power tank when shooting from a remote location. If you want to photograph meteors all night long, you will need to be able to keep condensation off of your lens. Dew in the summer and frost in the winter can fog out your lens within the first hour of shooting. The most effective tool for preventing this is an astronomy dew heater designed for use with a telescope. An Internet search for ‘dew heater’ will reveal numerous tools that can do the job. Most are just a Velcro strap that you wrap around the camera lens. A wire run through the strap is heated by electricity and this keeps the lens warm enough to prevent condensation. Most dew heaters are powered by a DC power source, so a DC power camera adapter and the Celestron Power Tank compliment the dew heater nicely. Your camera and these 3 accessories (dew heater, DC adapter and tank battery) make a powerful astrophotography bundle that you can easily take anywhere. Focusing is one of the most important steps, and your images should always be reviewed on a big computer screen before committing an entire night to the current settings. In general, to image the night’s sky, you must turn off auto focus and move the lens focus to the infinity position. This is often the last stop on the focus knob, but on some lenses perfect focus can be just short of this or just after it. I recommend using an A/B test procedure and the LCD lens at full zoom. For example, set the camera focus to infinity and take the first picture. Now bring the camera focus one step closer or further away from the infinity position and take the second picture. Find a star in the picture and zoom in as much as possible on that star. Switch back and forth between the two pictures to see which focus is better. Change focus directions when the focus starts to degrade. Do this above and below the infinity position until you find the perfect focus position for your lens. Finally, review the photo in your computer and make sure it looks good before shooting all night with this focus position. When you are starting out with anything new, it’s important to experiment, test different methods and fine tune your procedures to find out what works best for your equipment and your night sky. I am still tweaking different aspects of my methods, settings and equipment and improving on the effectiveness and quality of my meteor photography. However, there is a core part of the procedure that remains constant every night. Keeping it simple and having a documented routine greatly increases the chances of not making a dumb mistake and ruining a night’s worth of opportunity. Here is the procedure that I follow when setting up and executing a meteor photography run. Have a charged Celestron Power Tank handy. Set camera exposure time considering light pollution, usually between 10-25 seconds. Check in within first hour of shooting and a few times through the night. Set alarm to retrieve camera at dawn and then go to bed. If everything is working right, and you are located in a safe, crime free area, you can go to bed after the first check in, and the camera should operate all night long. Things that can potentially go wrong and ruin your imaging session include: filling up your memory card early, running out of power, having your lens fog up or frost over, shooting out of focus, or taking pictures with the wrong combination of ISO, f/ratio and exposure time. Documenting and following the same procedure every time will help guarantee success on most of your image runs. It could rain, or your camera could be stolen or knocked over by the wind, so plan accordingly. You should also make plans to retrieve the camera at dawn, as taking long exposures of sunlight puts unnecessary strain on your camera’s CCD chip. In the morning you will have a potential treasure trove of meteor photos waiting for you. Finding a few meteor gems in an ocean of 500 or more pictures can be time consuming if you don’t have a good review process. Of critical importance to the review procedure is having a low res version of the pictures so you can quickly scan through them on your computer. I recommend saving the images in two formats; RAW will preserve the image in the highest quality possible, and a medium or low resolution JPEG will allow you to preview the image without having to wait for your computer to load and render it (something that can take a few seconds with high res images). When I review the images I open just the JPGs in an image viewing program. I then press the cursor key to advance the image and I keep it pressed in. This creates a movie type of effect with a frame rate of about 1-2 frames per second. I then quickly scan the entire image looking for irregular differences or flashes and stop when I see them. I have to weed out plane and satellite trails but eventually am left with a few good meteor photos. Each time I find a photo containing a meteor I rename the file by adding the prefix ‘meteor’ to the file name. This will keep the picture out of the batch the next time I do my review. I will usually do this review at least two or three times and sometimes more depending on the field of view. During some showers, like the Geminids, when using a wide angle fisheye lens, I may review the lot five or more times and continue to find meteor photos after each pass. Once I’m confident I have found and renamed all of the meteor photos, I create a directory on the memory card named after the date and shower name and move the meteor photos into that directory. I will then delete the rest of the photos on the memory card and free up the space by emptying the trash or recycle bin. Keeping an entire night’s worth of high res photos takes up lots of gigs of space and is a waste of time and resources to copy to your hard drive. That’s why I perform the review and file separation on the card the day after the imaging session. I then only copy over the meteor photos to my computer, instead of the entire night’s images. Now that you have some meteor photos, what do you do with them? In the next few months the AMSMeteors.org website will be adding a new feature that will allow you to upload and share your photos on the AMS website. In addition there are numerous outlets where you can publish your meteor pictures, including: The Meteor Observers Mailing List, Space.com, facebook, cloudy nights and other astronomy websites. During a meteor shower there is usually a lot of interest from the media and local news websites, and blogs will often gladly publish your meteor photos. I have even seen some meteor photos get published on national news websites. Scientifically you can determine the meteor frequency as determined by your camera and tally the meteor counts in the same way you would a visual session. While these counts may be less than those of visual observers (because the faintest meteors aren’t caught), a frequency count of DSLR meteors would be interesting to track over the course of a meteor shower or from year to year. From a plotting perspective, a DSLR will record a meteor location with a level of precision much higher than other recording devices like all sky cameras. This is because thousands of stars are captured in a long exposure compared to the dozen or so stars caught by a video camera. The larger image size and higher resolution picture also makes precise plotting much more reliable. While the all sky video camera will gather more scientific data, especially the meteor velocity and light curve, the lack of resolution and star detail in an all sky system are shortcomings. For these reasons, I believe the perfect all sky solution would use both a video camera and a DSLR with a fast full sky lens attached. This combination would allow the elevation and azimuth angles associated with a fireball to be determined with a much greater level of accuracy. In the months ahead, the AMS will be working to grow the base of DSLR meteor observers and will offer an area for these observers to track and share their meteor photographs. 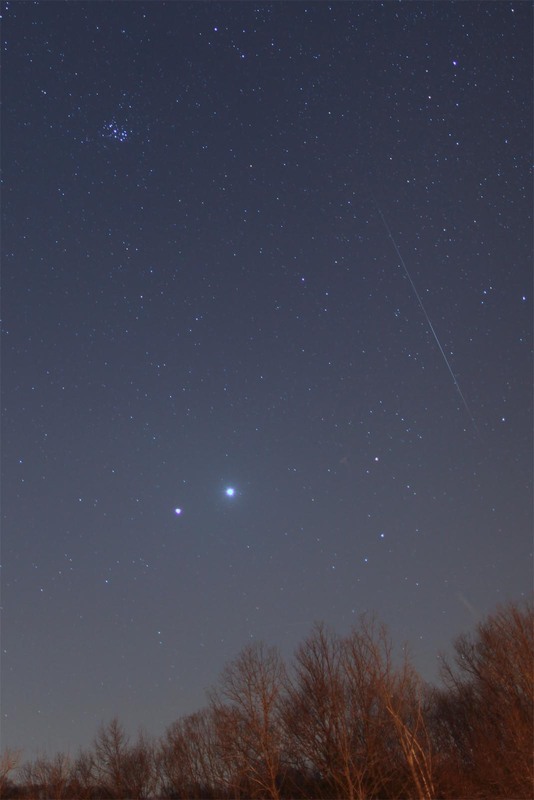 Consider augmenting or sometimes replacing your observing routine with meteor photography. DSLR meteor observing is an easy and fun way to collect valuable meteor shower and fireball data without losing sleep or toes.